Jayaruh Brushes and how to get one!! I am still in Mexico on a business trip and it is a national holiday today – the birthday of Benito Juárez – it is not time for a history lesson so if you want to know more then follow the link. Today’s shave was nice apart from me cutting myself again… but that is not the point of the post. 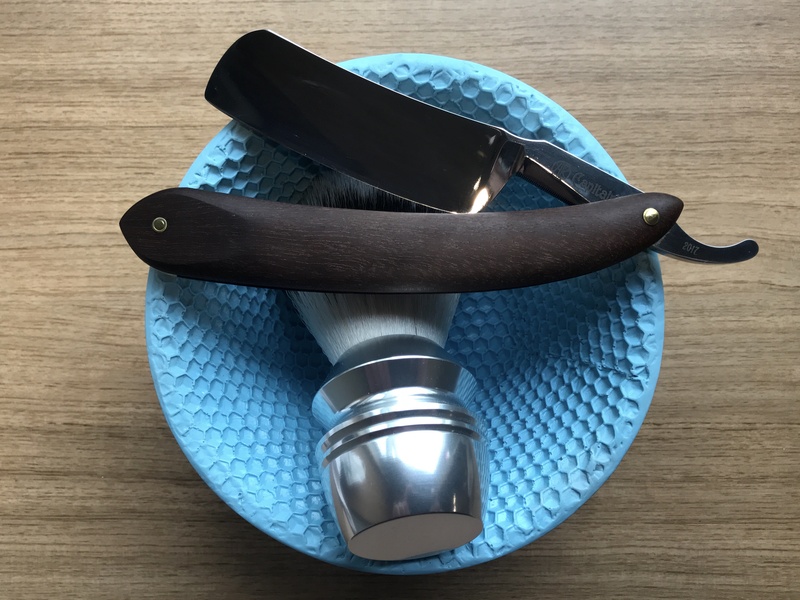 The lather was super, the bowl was great and the blade cut me – shave over!! The point of this post is to introduce to a wider audience the brushes made by Jim Roe, otherwise known as Jayaruh on The Shave Den forum. I came across Jayaruh by chance. 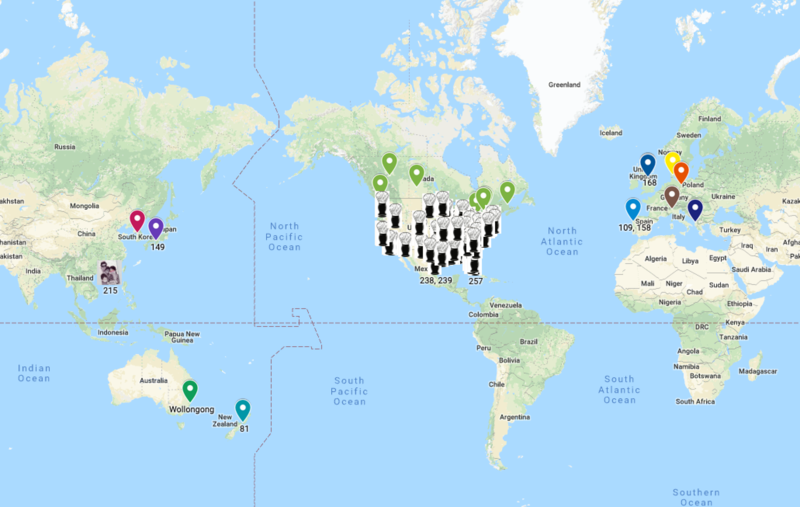 You know that in forums people have signatures and some of them have clubs – ie sub-groupings of like minded people who have the same taste in brushes, or soaps or whatever – for example The Chub Club. I began to notice a few people had one called the Jayaruh Owners Club – intrigued, I started to look up this mysterious Jayaruh. It seems his brushes were sought after. I MUST have one and become a member I thought… so what I did was a bit naughty. I found Jayaruh and contacted Jim in a PM. I asked him about his brushes, I wanted a Rubberset 400 style if possible, with a boar knot. He had just the brush – Jararuh #215. So behold, JR #215 fitted with a lovely Omega 10098 boar knot. Tt is beautifully turned by hand in some exotic wood [Bocote] or other and an aluminium ferrule is threaded on to the handle. The boar knot is aces. I did not pay for my brush – I swapped him for an Alpha T-400!! – he’s happy, I’m happy!! Jim is a great guy and an easy bloke to deal with – come on, what are you waiting for – lets get a Jayaruh brush on every continent!! Today’s shave is kind of grabbed between travel trips. I came to India thinking I was staying 3 days and I packed a straight just for the hell of it. When I got here the plans changed and I am only staying one day and then I am off to Korea tomorrow. So it is a quick shave and then pack up again ready for the flight. This is an unusual shave fro me in that I am using a synthetic knot – this is the FIRST time in two years of proper shaving that I have used a synthetic. So why not go big eh? This is called “The King” or the “King of Chub”. The brush is a doorstop, designed by my own good hands and machined to sheeny perfection. It stands about 50mm tall and is 47mm wide at the widest point. A true stubby chubby. The knot is a 30mm, yes you read that right, a 30mm synthetic set just deep enough to give is a whole lot of back bone. The brush feels as soft as a badger with the backbone of a nicely broken in boar – a little scritchy but nice!!! This was my first ever shave with a synthetic knot. Today’s razor of choice is a Capitaine from Art razor in Ukraine. 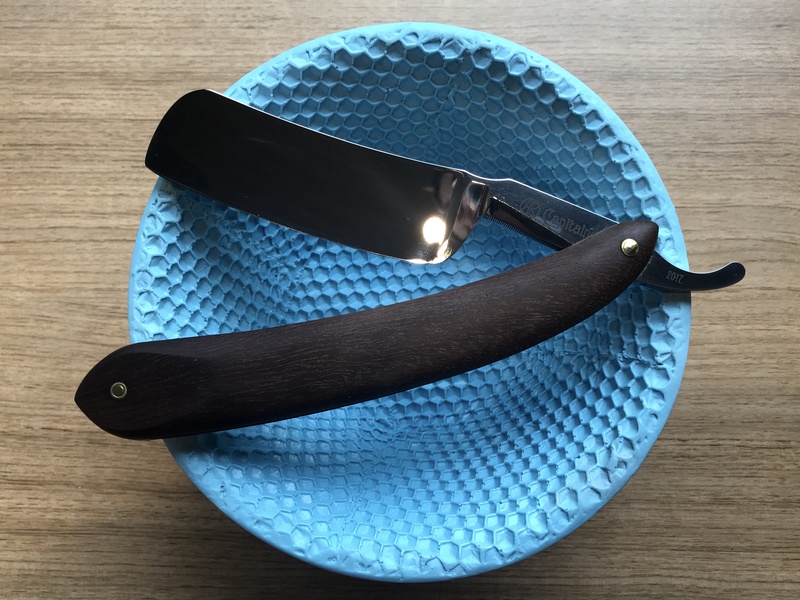 This is a beast of a razor with a fantastic edge, Yuri over at Art Razor sure knows what he is doing – if you have not got an Art Razor then get one… This one is an 8/8” near wedge and again is is AWESOME. Swedish carbon steel, great scales and perfectly polished. “Safe haven of dangerous, boisterous, drunken, and bawdy. Tortuga is pirate heaven, now make it yours. It is the amber and the cherry that particularly appeal to me here and it is a rich cherry cake smell. I love it. It lather great after a short bloom, 40-60 seconds tip loading and 2-3 minutes whipping up. Please please PLEASE Crows nest start making soap again – we need the Jack Daw!! The shave was awesome – watch the video as it says more than I can ever write. Needless to say I ended up with a DFS and a great fragrance all round. “A situation or circumstance that is foreign, unclear, and unfamiliar and altogether dangerous as a result. It is a very simple combo but my oh my does it work. Spicy but not too much, woody, but not too much – it just works. 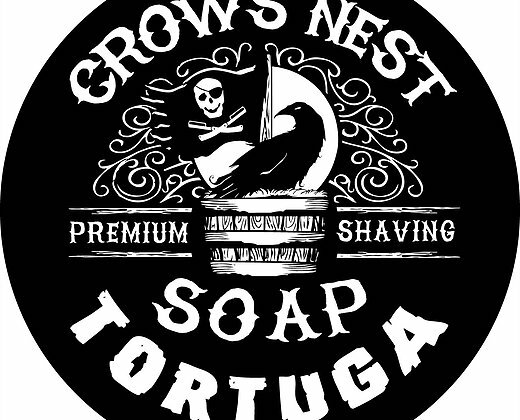 I am after a Jack Daw soap too in order to complete my trio of Crows nest soaps and I emailed the guy yesterday – no answer yet!!! Anyway dudes happy shaving – Steve.